Denis MacShane is the former UK minister for Europe. He has written three books on Brexit and advises companies and government on Brexit. Far from uniting Britain after the bitterly divisive Brexit referendum vote when just 37 per cent of the total British electorate voted to leave the European Union, the Withdrawal Agreement and linked declaration on future areas to be negotiated, has launched a new round of recriminations. Several ministers have resigned and others are forming a cabal to demand that prime minister Theresa May returns to Brussels and renegotiates a new accord. There have been loud calls from senior Conservatives headed by Boris Johnson denouncing the deal as the end of a 1000 years of parliamentary supremacy in the UK. The former minister of foreign affairs appears to think William the Conqueror brought with him a functioning House of Commons when he arrived in Britain in 1066. This hyperbole can be heard for many other Conservative MPs who are demanding that Mrs May is replaced by a more passionately anti-European prime minister. She meanwhile continues to insist that her deal is the best possible outcome. She has yet to find a clear majority of MPs to support her. She is now paying to price for her handling of Brexit since she became prime minister in July 2016. Instead of reaching out to unify the nation, creating a spirit of bi-partisan cooperation, setting up working parties with the CBI and the TUC,, with universities, with different national regions of Britain – Scotland, Wales, Northern Ireland or with the Mayor of London and other big cities – she decided to speak only for and to the hardline supporters of Brexit. She hoped this continuation of the anti-EU rhetoric after the referendum that produced Brexit would win her support. But when in 2017 she tried to capitalise on this by holding a general election she was badly defeated and the left-wing leadership of Jeremy Corbyn was endorsed. She lost the majority the Tories won in 2015 and had to reply on hard right-wing protestant MPs from Northern Ireland who dislike Dublin, dislike Brussels, and refuse to apply UK laws on gay and women’s rights to the people of Northern Ireland. Now the extreme protestant Northern Irish MPs say they will vote against her deal. So does the Labour Party, the Liberal Democrats, the Scottish and Welsh nationalists, and Green MPs. If that block against the deal holds together and is joined by the anti-European Tory MPs who want a complete amputation with the EU – rejecting membership of the Customs Union, the Single Market, freedom of movement for Brits to live in Europe or EU citizens to work in Britain and a role for the court of justice of the European Union then the deal will not be accepted by the House of Commons and Mrs May cannot stay in office. Supporters of a new referendum like Tony Blair and “People’s Vote” campaigners have also urged MPs to vote down the deal. All opinion polls now show a majority to stay in the EU. Each year in England about 700,000 older people die and the same number reach the age of 18 and can vote. It was older English voters who voted massively for Brexit while four out of five 18-24 year old voters voted to stay in Europe. So the argument is that the majority for Brexit has disappeared. The former prime ministers, like the Tory Sir John Major and Labour’s Gordon Brown, urge a new referendum as does the Mayor of London and the editor of Rupert Mudoch’s paper, The Times. Mrs May presents the demands for a new vote and a rejection of her deal as leading to economic chaos and collapse. She may yet win support as Angela Merkel and other EU leaders have said there can be no renegotiation. This is the only deal on offer. Companies like Airbus and Siemens are stockpiling millions of spare parts. If MPs refuse the deal then the port of Dover through which 4,500 lorries arrive every day with food, medicines, and products will face delays for customs checks. South East England and the Calais region of France will become a giant parking lot for lorries. Even if the deal is agreed, the EU and the UK have to negotiate a completely new arrangement covering everything from trade in goods ands services, aviation, to data protection, police cooperation, and human rights. This will take years during which time the UK will de facto stay part of the EU even if formal political membership end next March. Denis McShame – is a convicted fraudster – and has zero credibility! 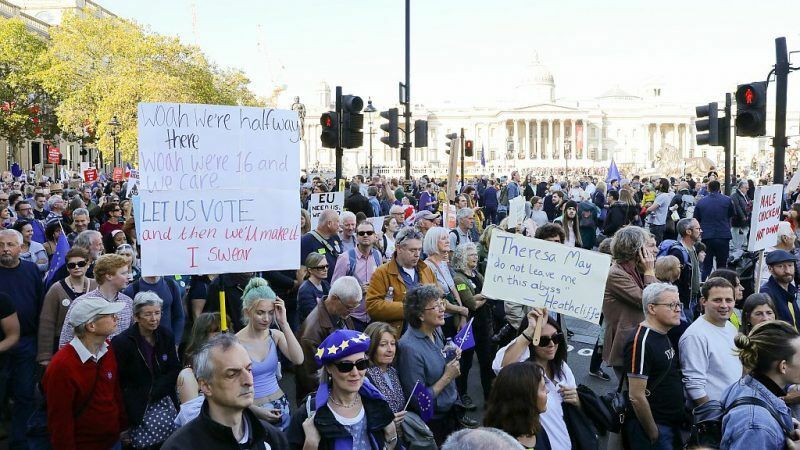 If older, Brexit inclined Brits are indeed dying off at a rate of seven hundred thousand per year, then there might indeed be some hope. That would then include most the commentators here. Perhaps in ten years time there will be a sufficient change in attitude.